Hello. Of late I've noticed that Model 64 and 65 police trade-in's are showing up on the market. 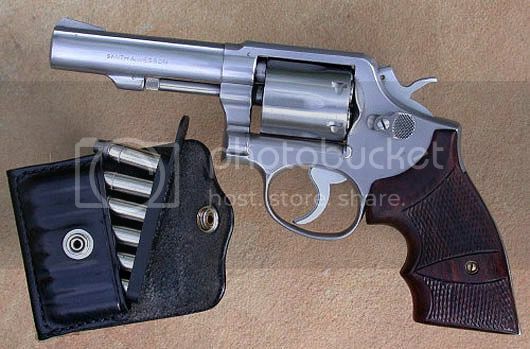 In my early years of policing, 4" DA revolvers in either .38 Special or .357 Magnum were the choices and though semiautomatics have pretty much filled police holsters today, I never felt undergunned with the old revolver. Do not misunderstand; I appreciate and use the autoloader a great deal and remain especially fond of the 9mm Hi Power and .45's in the 1911 pattern, but believe that a slick DA revolver remains a viable defensive tool and for me, just a heck of a lot of fun to shoot, something that rates very highly. A while back, I bought a NIB S&W Model 64-1 from friend at a fair price. It appeared to be nothing special but did have a very nice DA out of the box. The single-action is typical, light and crisp. I hoped that the fixed sights were "on" and as it turns out, I couldn't be happier in that regard; with either 158-gr. 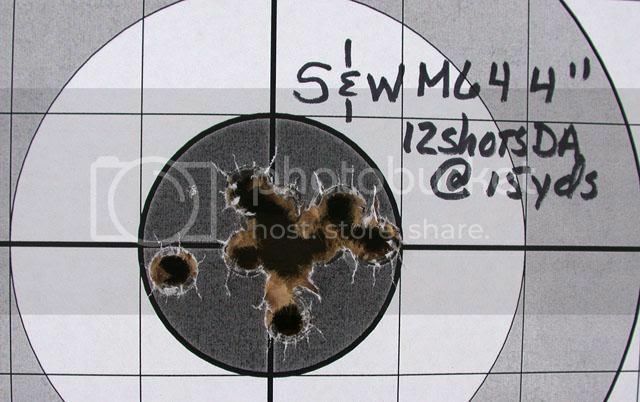 hard cast SWC's handloaded to just under 900 ft/sec or with my preferred "serious" load (Remington 158-gr. LHP +P), the revolver puts them exactly to POA out to 15 yards and with a 6 O'-Clock hold it does the same at 25 yards. All was not perfect, however. The cylinder would sometimes lock up. This was cured with a tiny bit of stoning of the hand by my gunsmith. It seems that the cylinder was trying to turn before the cylinder stop could lower. I removed a tiny burr in another location and cutting to the chase, the gun's run fine for roughly 600 rounds since and I believe the intial problem has been resolved. 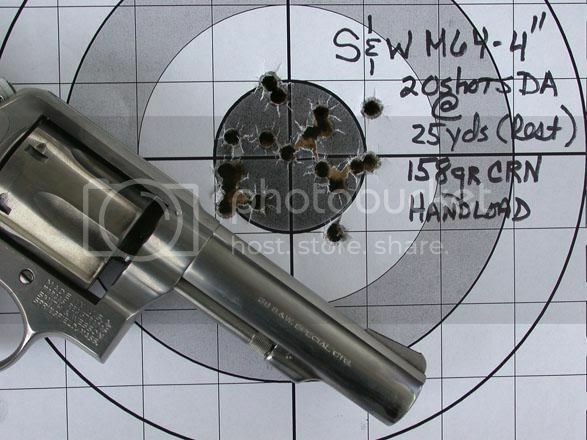 None of my other S&W K-frames have exhibited this problem, but to me this serves as but another example that no gun should be assumed reliable until tested...regardless of the manufacturer. The revolver is stock other than my sticking on an old pair of Uncle Mike rubber grips. Well, one "custom" touch was blackening the serrated ramp front sight with a black Sharpie. 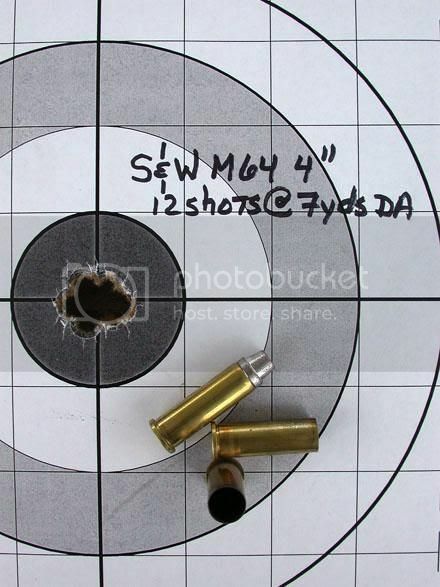 Shooting: Shooting was done at 5, 7, 15 and 25 yards and all was done double-action. Ammunition used was handloaded 158-gr. cast SWC or CRN. 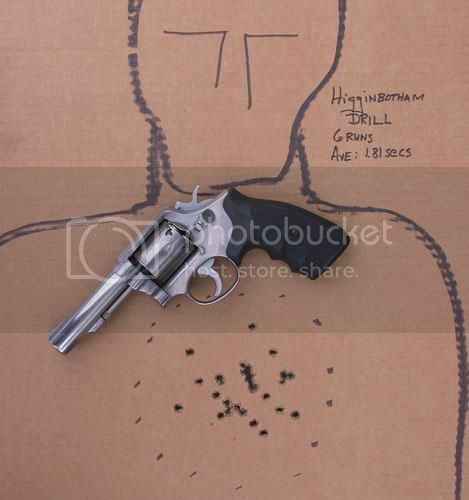 Both of these hit right at the 900 ft/sec mark from this revolver and both are consistent, having extreme velocity spreads of no more than about 18 ft/sec. 5-Yards: At this close range, I decided to try Mr. Jim Higginbotham's "Standard Controllability Drill" which is 5 shots @ 5 yards in less than 2 seconds, starting from a low ready position. All shots are to be within a 5 1/2 x 8 1/2" rectangle to pass. I did a slight variation on this and used my standard hand-draw "Gort" target with a similar sized dotted circular outlined area as the target. A total of 30 shots were fired, or 6 runs of 5-shots each. Average time was 1.81 seconds with the highest time being 1.88 seconds. This seems to be about the best I can do DA so I reckon that Mr. Miculek has nothing to fear from me! Ammunition used was the 158-gr. CRN handload mentioned previously. Some have stated that the handgun's purpose is self-protection and I fully agree that this is certainly one most important aspect of handgunning for most of us, but I still maintain that the purpose of my handguns are whatever I want it to be...within reason. I place high value on (usually) being able to hit what I aim at so this was about all of the "practical" shooting done. The rest of the shooting today was done double-action. 7-Yards: This was not timed but was definitely slower than for the previous drill. The reason was two-fold, I wasn't intending to shoot quickly but mainly forgot to set the timer! I would estimate that roughly 1 sec/shot would be the cadence. Two cylinders-full of the CSWC handload were fired standing and in double-action using a two-hand hold. The group here is nothing special as many revolver fans will attest; the purpose for me was to make sure that any "yanking" of the trigger was gone. I tend to do this more than I like when shooting at maximum speed (for me) and do all I can to make sure that it doesn't bleed over into all of my handgun shooting. This may or may not be a problem for others. 15 Yards: At this distance, essentially the same thing was done as at the 7-yd line. Ammunition used was again the CSWC handload. 25-Yards: Here I did shoot using two-hands, but seated and with my wrists braced. Shooting was slow-fire and double-action. 20 shots were fired with absolutely no effort at speed. I estimate that roughly 3 seconds per shot would be pretty close to the actual cadence but I didn't pay any real attention to that. This is better than I normally shoot at this distance. Today was just an "on" day. I admit freely that I cannot do this on command on any given day. (I had hoped to shoot some at 50 yards but that range was occupied by fellows trying to get their rifle scopes and POI's to match before moving to the longer 100 and 200 yard ranges. Conclusion & Observations: Today's session reinforced my respect for the old Model 10 and its variants. On the several Model 10 and Model 64's I've owned over the decades, most were sighted in very well from the factory and all would at least hit very close to POA. I got lucky with this particular Model 64 in that as closely as I can tell, POA matches POI for me with the loads I will primarily use in this handgun. There were no failures to fire nor sticky extraction; in short, the revolver ran perfectly. I regret that I didn't hang on the Model 10's, 64's and 65's I owned when they were common as the proverbial "hen's teeth." This one is not for sale...at any sane price. I intend to keep it and shoot it quite a lot, something that can be done using the "honest" .38 Special handloads mentioned w/o fear of damaging the revolver. It may be "only" a .38 Special but for me, it will do 99% (or better) of what I expect from a side gun. Some may disagree and that's fine; shoot what you enjoy most and can hit best with. I'll continue with my 9mm's, .45's, and so forth, but as I get older, I find myself enjoying revolvers more and more and appreciate not having to chase brass for reloading. Fouling on the muzzle was quite uniform, indicating that the crown was just fine as it came from the factory. Though intended as a service revolver, the Model 64 is capable of much greater mechanical accuracy than I can wring out of it. Though I do not find them as comfortable as the Uncle Mike "Goodyear's", were I to carry this revolver concealed, I would likely use these Eagle Secret Service stocks. 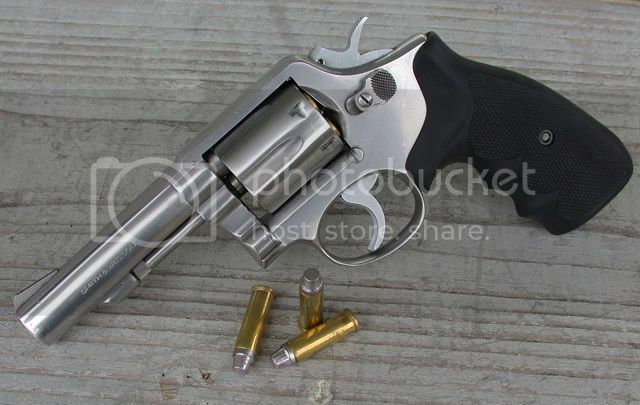 I see this revolver as a fun gun for the range or open carry when knocking around on a friend's ranch or in the woods. 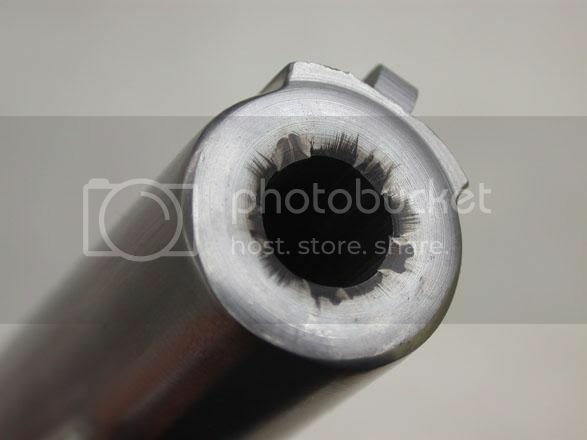 If in the market for a .38 revolver for similar reasons, I'd take a real hard look at clean Model 10's or Model 64's, be they in the heavy bbl versions I own or the "pencil" barrels. They'd been shooters in one form or another for roughly a century and have evidently met at least most users' expectations to have this sort of longevity. Take a look and take a chance on one; I think that you might be very surprised and pleased.